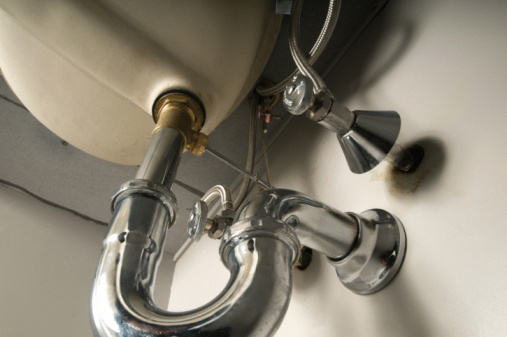 When you smell sewer gasses coming from the area around your kitchen sink, the smells are not only offensive but they can put anyone in the house at risk until the source of the sewer gas leak is found and taken care of. You can do some activities yourself to find the cause and correct the problem before you call a plumber. The curving trap is designed to keep sewer smells from coming out of the drain opening. Sewer gasses are toxic and should not be breathed for long periods, making finding the source of the gasses a high priority. Clear out the home, especially if the smell is throughout the house, until you can come to a resolution if at all possible. Sewer gasses can also contain methane, which is flammable and poses a fire risk to the house. The trap is the curved portion of the pipe that you see under the kitchen sink. It is designed to keep water inside it at all times and has a small cap at the lowest point that you can remove to drain out the water and remove any stuck objects inside. When you don't use the kitchen sink for a prolonged period, the trap can actually dry out as the water evaporates, allowing sewer gasses to pass up the pipe. How quickly the water evaporates depends on where you live and the humidity levels in your house. Refilling the sink's trap by running the faucet for a minute or more will block the sewer gasses from coming up through the drain pipes again. Every plumbing appliance, including kitchen sinks, uses a vent pipe, which you can see sticking out of the roof of the house. The vent pipes replace air that is flushed down the drain when you run the sink's faucet. Although not very common, obstructions may find their way into a vent pipe, such as a tennis ball, leaves or a bird's nest that has been built over the pipe's opening. You can remove obstructions yourself if you can see them plainly, but a plumber can send fake smoke through the house's vent pipes to not only find clogs but also leaks in the pipes. If you use the kitchen sink regularly, the trap should be full of water, so the problem may come from damaged or leaking pipes. The leaking pipes can drain the trap quickly, one drip at a time, or they can be large enough if they are located before the trap that sewer gasses can come through the hole. If the leak is where two sections of pipe connect, you can try tightening the connection using your hands or a pipe wrench.